First of all we thought it would be really, really funny to review Hooters for our restaurant beginning with an H. The idea amused our friends, male acquaintances started heckling for an invitation and we quietly congratulated ourselves on the brilliance of our own imagination. But when we checked the Hooters web page for directions and stumbled across a photographic depiction of their menu, our sense of humour took an abrupt and irretrievable nosedive. The images of enormous plates stacked with hefty sandwiches and buckets brimming with unpalatable-looking food was more than we could handle. At that point we knew funny-ha-ha just wouldn't be good enough for our food-loving public and so we resolved to highlight an H restaurant we were confident would serve up decent food, instead. So, in alliterative mood, we hopped off to the The Helmand, to meet fellow food blogger Mr Haddock and his missus. One of the most surprising but satisfying side effects of blogging about what we eat, is that has led to us meeting all kinds of interesting and food-obsessed people residing in the Bay Area. Haddock, the Chef behind Knife's Edge and his lovely wife, aka the GM, own a restaurant in a more remote corner of California, over 3 hours North of San Francisco. Haddock's blog is a vehicle for him to let off steam, a link with the outside world, where he can rant and rave, almost anonymously, about the experience of trying to be a small town restauranteur with high ideals. Because he writes so candidly about a side of the restaurant business that customers rarely get to see, Haddock has gained a small but loyal following of food blogging fans in the Bay area, several of whom he has already met. Haddock spends a few days each month soaking up the culture and looking for inspiration in San Francisco and so we were delighted when he asked us if, this time, we would join him for dinner. Although he really likes to try new places Haddock kindly agreed to pay a return visit, to what is generally regarded as the best Afghan restaurant in town, for the sake of this report. 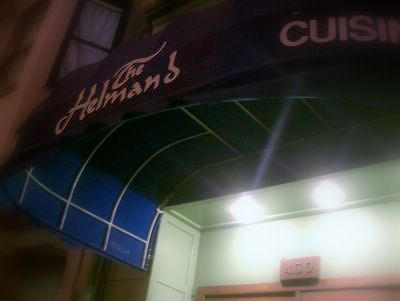 Situated on a lively strip in North Beach, nestled between strip joints, bars and restaurants, it is easy to miss the small entrance to what might be one of the most satisfying and fairly priced meals in the area. The decor is traditional and old fashioned. Carpeted floor, tables set with crisp white cloths and large, comfortable, blue velveteen chairs set the stage for the tasty feast ahead. A basket of flat bread is brought to the table with three little glass bowls of sauce. The first, with a spicy little kick, is a bright red tomato-based dip that can be cooled down by creamy white yoghurt blend sitting next in line. This, in turn, can be enlivened by a piquant green mix made from fresh cilantro. The portions are generous enough that when enough bread has been broken and it is time to eat the entrees, these condiments can be used to further enhance the flavours of the main dishes. To start, we share a selection of appetizers. Helmand do a great job of catering for vegetarians so many of their appetizers are available in both meat and meatless versions. Aushak - raviolis filled with leeks and scallions served on a a yoghurt, mint and garlic sauce are gloriously healthy and fresh-tasting. The vegetable filling is perfectly cooked so that the greens still have structure and are bright and vibrant in colour. The thin pasta shell is soft and smooth. Whilst both versions are delectable, we find the vegetarian option, topped with yellow split-peas and carrot sauce to have a slight edge over the carnivourous version smothered in ground beef and mint. Another Helmand speciality is the famous Kaddo made of pumpkin that is fried before it is baked and then seasoned with sugar. We don't even like pumpkin much, let alone savoury food that has been purposely sweetened, but somehow, once the sunny-looking orange vegetable has been decorated with an ample spoonful of rich, reddish-brown ground beef sauce and more of the house yoghurt, this appetizer takes on a satisfying unique flavour that is almost impossible to stop picking at. 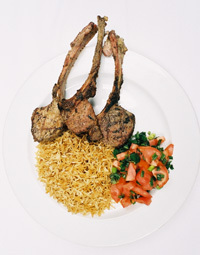 For our main dish, we never can resist the Chowpan described on the menu as a Half Rack of lamb marinated, grilled and served on a bed of Afghan bread with sauteed eggplant and pallow rice. The rack is divided into three, huge, juicy lamb chops, as flavoursome and as tender as can be. Afghan bread turns out to be a very thin, flat, unrisen bread something like a tortilla or a roti. The aubergine on the side is rich with tomato and, like the rice which has been seasoned with several spices, is less complex tasting than you imagine it would be. Despite the fact it is fairly plain we still like this dish, especially once we have perked it up with the sauces described earlier. We regret always going for the same thing and not being more adventurous sometimes when we steal a taste from another plate. The Kofta Kabab, fashioned from ground beef, green onion, fresh cilantro, garlic and hot pepper, before being grilled, packs a welcome punch on our tastebuds. Fantastic stuff. A must-have for us on another visit. A side dish of Bendi - okra sauteed with onion, fresh tomatoes, black pepper and garlic is a little bit similar to the flavour of the eggplant. The okra themselves, however, are well cooked, a perfect example of how okra should be prepared. Neither too dry or too slimy, Helmand showcases this sometimes unpopular vegetable to its advantage. Meeting strangers for the first time over dinner could be a recipe for a disaster, but Mr and Mrs Haddock were so agreeable and easy to get along with we had no problem drawing out our meal over a period of almost three hours. There was never any embarassed slicence, we didn't run out of things to talk about and it was a lot of fun. Reluctant to leave when conversation had not been exhausted, we dawdled even further over some delicious cups of cardamom-infused tea. Helmand on a Sunday night was a well-suited location for good food, excellent company and interesting conversation with a bill that was reasonable too, coming in at just under $100 for the four of us before a tip. Helmand is suitable for other occasions as well. A short while back, I organised a meal for a dozen lively friends in a party mood and on that occasion we chose Helmand too. We made a reservation for late (9.15pm) calling a few minutes before from a bar down the street to make sure our table was actually ready. (This is an excellent tip - there is no bar at Helmand so waiting for a table inside the tiny entrance area can be miserable). We had an excellent time on that occasion too, a varied selection of appetizers, half a dozen bottles of wine and an entree each and still the damage was only $32 each, tip and tax included. Helmand - we can't really fault it - solid, central, well-priced, tasty, consistent and a friend to meat eaters and vegetarians alike. Other local views of Helmand can be found on Yelp, Citysearch, Dine.com and Chowhound. It is Utensibility Week here on Becks & Posh. All bloggers are invited to join me in creating a dream list of favourite kitchen utensils. You have until the end of play tomorrow to post your utensibility entry. we really were intent on doing it but the food pictures actually made me feel ill. I guess I am not really the kind of person they are trying to attract, I mean we never ever eat dinner in front of the TV, or even with the TV turned on, so a sports bar isn't the place for us. I am sure Hooters aren't going to care that they lost me as a potential customer. I am sure I am not their demographc. I think Fred still wants to give it a go though. I can't imagine why...?! Sam, I definately think you arent in their demographic... you have whats the word? Oh yeah, Class. somewhere I have always managed to avoid, but I dont think it would be fair on you.... I think hooters makes our unreasonably expensive aussie equivalent look ok. Now that is scary. I was really surprised that I'd like the pumpkin/yogurt dish also...but yum! I also really like the eggplant thingy with tomato sauce. One of the best things about Helmand is the $10 all-you-can-eat lunch buffet which allows you sample many of their evening entrees at your own pace. I think it's the best Indian/Arabic food in North Beach that isn't Indian or Arabic. Wow! This is the most glowing review in ages! I too gave it high marks about a year ago, August of last year when I reviewed it. I also discovered a bit of trivia, the proprietor of the restaurant is the brother of Hamid Karzai, the president of Afghanistan. clare - I am not sure you are going to be eating at Hogs Breath any time soon. Bacon Press & Amy - good to hear other local food bloggers like Helmand too. I had linked to the website in the article (in the address at the top) and infact the pictures of the food are from the website. I had heard the rumour about the brother and the president but as their website didn't confirm it I didn't want to state it in the post. Amy - I did go to your site looking for restaurant reviews but they aren't indexed so I had a bit of trouble searching. If you want to be referenced from here, send me the link I will add it to this post. We eat at Helmand at LEAST 4 or 5 times a year; I don't know why I haven't blogged it yet, but I should. Interestingly, not only is the proprietor Hamid Karzai's brother, but another brother has a Helmand restaurant in Boston, as well. Afghani Farsi (or Darye) is different enough that I can understand every few words when he speaks to me. It's pretty funny. I used to love the Helmand. I miss that Kaddo SO much. Thank you so much for that post. I love reading about places like that. I haven't been there (or anywhere else in SF for that matter!) in 5 years and I am so happy to hear it is still there and going strong. Just browsing through your site, and enjoying all of it, as always. This review particularly struck my eye, since we're going to be making a cross-country odyssey this summer, and expect to land in the Bay Area sometime in early August. We're looking for good, reasonable places to eat, as well as must-try places, and this really seems to fit the bill. I love Afghani (and really all forms of Middle Eastern) food -- can't wait to try this one! Julie - I hope you enjoy it. 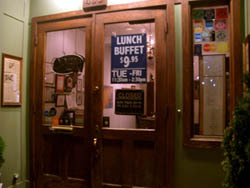 It is not the slightest bit trendy or anything, just a comfortable, good old-fashioned restaurant with great food and reasonable prices in the heart of North Beach. You could probably spend more money on parking than on dinner!